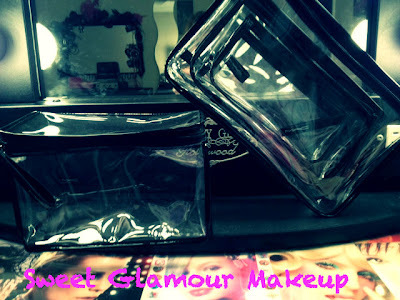 ♥ Sweet Glamour Makeup ♥: M.A.C COSMETICS CLEARLY MAC MAKEUP BAGS REVIEW! M.A.C COSMETICS CLEARLY MAC MAKEUP BAGS REVIEW! I recently went to the M.A.C Pro store in Orlando at Millenia mall and got some awesome goodies! The pro store carries a wide array of products regular stores and counters don't have. They have pigments,glitters,acrylic paints,different brushes,airbrush kits and much more! One thing I've had my eye on for awhile were the Clearly M.A.C cosmetic bags. These are great for makeup artists,or someone who want to be more organized. It's clear,so it makes it easier to see what you need. I got 2 different kinds;the trio set ($28) and the individual ($20). I can't wait to fill it up and use it for makeup gigs! What do you think about the clearly M.A.C bags? Have you seen anything like it? Labels: Clearly M.A.C, M.A.C Cosmetics, M.A.C Pro, Makeup bags.